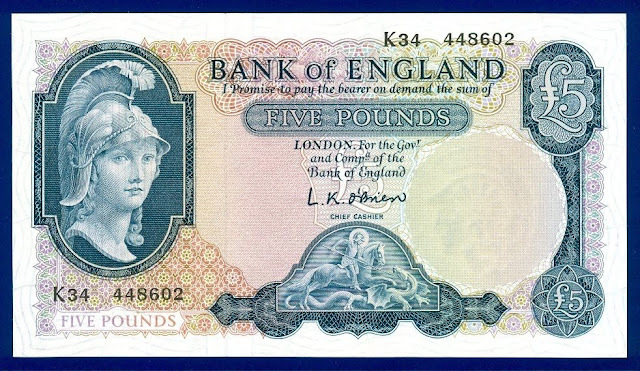 Banknotes of the pound sterling, British banknotes, British bank notes, British paper money, English Pound, Great Britain banknotes, British Pound money currency, Great Britain bank notes, GBP British Pound, Great Britain paper money, English Bank Notes, English Paper Money, English banknotes, British pounds. Obverse: Blue and multicolor. Helmeted Britannia head at left, St. George and dragon at lower center. Signature L.K. O'Brien. 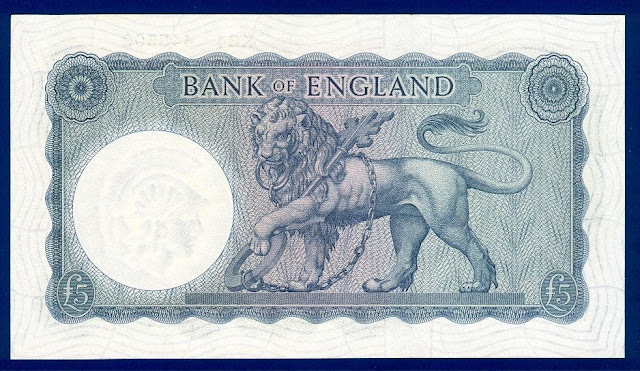 Reverse: British Lion holding a chained double sided key depicting the strength of the Britain's economy - standing left. Denomination £5 in blue print on back. Only one note in this series was ever issued - the £5, designed was by Stephen Gooden. This was issued in February 1957 and known as the Series B or Helmeted Britannia. Designs were produced for the 10/- and £1 notes but Gooden died before he could produce a design for the new £10 note. In 1956 the Queen consented to have her portrait appear on Bank of England notes and the 10/- and £1 notes were never issued. A slight variation in the design appears as the denomination being denoted by a white symbol on the reverse rather than a blue symbol.